Rural development in the EU is increasingly affected by changing market developments, decreasing population densities, urban sprawl, lack of employment, desertification and other environmental, economic and social pressures. On the other hand, coastal areas provide interesting business opportunities but are also influenced by economic activities in the hinterland. Multi-Actor Approaches are combined with System Dynamics to analyse the environmental, economic, and social interactions of rural and coastal areas in a holistic manner. The underlying feedback structures governing the dynamics, vulnerabilities, limitations, and business opportunities of the land-sea system are identified and analysed, taking into consideration the regulatory frameworks, stakeholder priorities and social-economic conditions at the local, regional and macro-regional scale levels. Multi-Actor Labs using qualitative and quantitative tools are set up to support the co-creation exchanges between scientific experts, stakeholders, business entrepreneurs, sector- and administrative representatives. The overarching objective of COASTAL is to improve the rural-coastal synergies in strategic business and policy decision making and collaboration between coastal and rural actors. This is achieved by developing, demonstrating and applying a generic toolset and performance indicators by combining a multi-actor approach with system dynamics modelling. This allows us to understand the interactions with market, demographic, environmental and climate forecasts, and quantify the positive and negative externalities. By combining local knowledge and scientific expertise in a co-creation process the COASTAL project engages actors and stakeholders at all levels to improve coastal-rural interdependence and collaboration by identifying problems and setting up evidence-based business roadmaps and policy solutions, focusing on economic growth, marine spatial planning, and environmental protection, including inland water quality. The multi-actor approach applied for analysing the social-environmental and economic land-sea interactions highlight potential cross-sectoral interactions and innovation that could emerge from greater cooperation between sea-based and land-based businesses or organisations while also considering the short-, mid- and long-term impacts of decision making and feedback mechanisms on coastal and rural development. Local actors and experts participate in collaborative exercises to analyse problems, the underlying causes, propose and discuss solutions, and validate and interpret the impacts of simulated business and policy decisions. Qualitative and quantitative techniques are combined in this co-creation process supported by graphical tools to gain in-depth understanding of the systemic transitions underlying the land-sea interactions. These systemic transitions are synthesized and analyzed with system dynamic models to produce multiple transition scenarios for key business and policy indicators. From these practical business roadmaps and policy solutions are derived, which are easily updated in the models used to support the analyses. Improved understanding of the short-, mid- and long-term impacts of land-based activities on coastal water quality, contributing to reduced coastal eutrophication levels in the region. Understanding and uptake of interactive techniques for group model building, significance of system feedback and regime shifts for mid- and long-term planning of business and policy solutions. 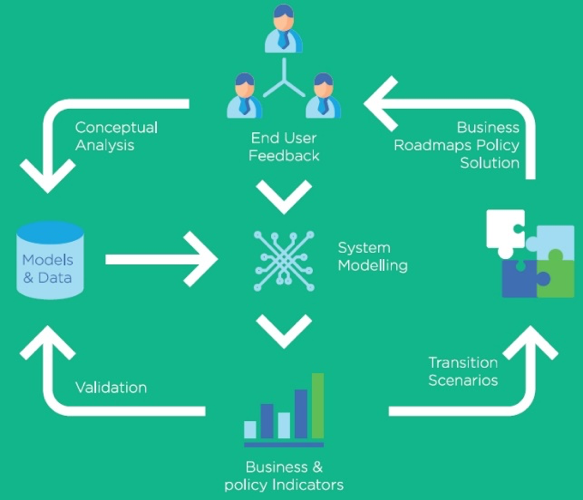 Transition of existing scientific models and data into a practical (SD) model to support business and policy analyses; improved expertise of the contributing partners and institutes with this transition process. Direct access to online, innovative tools and performance indicators and examples to demonstrate, analyse and compare different business and policy strategies. Region-specific business road maps and policy guidelines for improving coastal-rural synergy, exploiting the knowledge and experiences of the other case studies through the Multi-Actor Labs. This website reflects only the author's view and that the European Commission is not responsible for any use that may be made of the information it contains.